Tom's Vans - Your Local Moving and Packing Service - Brighton & Hove Man and Van Removal Service. House Removals - Nationwide Deliveries - Office Removals. Now in Bristol too!Tom's Vans – Your Local Moving and Packing Service | Brighton & Hove Man and Van Removal Service. House Removals – Nationwide Deliveries – Office Removals. Now in Bristol too! they were happy with the move as I can’t be on every move. I felt I had to share the reply I got this morning, which has cheered me up no end! Thank you so much for asking. The move went very well! Your men were outstanding, so kind, quick and very happy. They lifted my mood a lot and they made yesterday so much easier as I was feeling very low. I am so happy to have found your company, you have some amazing people there and I am very very grateful! I’m delighted to announce that Tom’s Vans will be raising money for UNICEF by competing in the 2019 Brighton Half Marathon. I am passionate about this charity, and have just started training for it (!) so please please show your support by clicking on the link below and give money to help the work of this fantastic charity. Need a “man with a van” service in Brighton? Please read on to get a feel for what Tom’s Vans is all about! It was a very busy January 2018 for us, which is great because we love to be busy helping moving people and seeing them settle into their new homes or offices! We are getting lots of repeat booking for deliveries to trade shows for local businesses and for supporting charity events too! It is always great to welcome back repeat customers. Tom’s Vans – Your Local Man with a Van have just returned from Valencia! We moved our delightful customer Belinda from Sussex to the old Town of Valencia and it was a pleasure to come back to an email from a very happy customer and a fab review on Facebook “Thank you and Mo for your help with moving all our stuff to Valencia. You were both brilliant, so helpful and good humoured, and we were so impressed by how accurately you stuck to your ETA! I hope you both enjoyed exploring the city and that your journey back to the UK wasn’t too tiring. I’m hoping that we may need to use you again, but meanwhile will recommend you to everyone. Established in 2010, Tom’s Vans Removals continues to be a Brighton moving company that people trust and recommend to their friends. I can’t believe it’s 8 years since I started Tom’s Vans – Your Local Man with a Van. My mission was to offer Brighton moves that are carried out with a professionalism that other man with a van operators were not getting anywhere close to. My motto has always been – Professional – Reliable -Affordable. Tom’s Vans Removals on Facebook! Our Brighton Man and Van Delivery service has got off to a fantastic start of Facebook and I am delighted to say that we now have many amazing ★★★★★ reviews for our local removals service. Take a sneak peak by clicking on this link – and don’t forget to “like” our page too! We really appreciate your support! https://www.facebook.com/pg/tomsvansremovals/reviews/ Latest Independent Testimonials: plucked freshly from my Google listing! Tom and his team provided an excellent service all round. Personable, flexible and very reasonable cost. We changed dates and venues more than once and nothing a problem. I will use no other company from now on. Brilliant service!!! Oli and Tom made our move a stressfree and very pleasant experience. They did everything we ask for and more (packing, moving and even unpacking!) We were very nervous about moving house with a newborn baby, but everything went perfectly thanks to them. I highly recommend Tom and his team and will definitely use him again if I decide to move again. I can honestly say that with each new year I get more and more excited about my Brighton Man and Van Removals service. Why is this? Well if you’ve used Tom’s Vans you’ll know why, but if not then here are just a few of the reasons. Here is a little collage of some our our latest Brighton Man with a Van jobs, and some of our delighted customers! Being able to offer this great service makes me very happy and gives me immense job satisfaction. This blog showcases some of what we have been doing and it’s always changing because no two days are the same at Tom’s Vans – Your Local Man with a Van! A Brighton Man and Van service that is second to none. If you’re moving within the local area or much further afield we can help. If you are moving an entire house, a flat or a small business needing a delivery to a trade show – we’ve got the experience to make sure you are over the moon with the service we offer! Keep reading to see more about our removals, office removals and delivery service. I have included a link below so you can see our latest reviews! Please do not hesitate in getting in touch for a quote or just a chat about how Tom’s Vans can help! Don’t forget to click on the locations tab to see our new locations too! The service we offer comes under two categories, Brighton Removals and Brighton Man with a Van. For larger house and flat as well as office moves we can provide two large Luton vans and a very capable and expert team who will ensure your removal goes nice and smoothly. Brighton Removals are generally priced as a fixed cost so you know exactly what you’re going to be paying. We never have any hidden charges. My main goal is to ensure my customers are satisfied and genuinely impressed with how the move went. When carrying out Brighton Removals one of the comments I often receive from my customers is how calm and positive my fantastic removals team is, which then in turn help my customers feel calm and at ease also on what can be a stressful day. Tom’s Vans – Your Local Man with a Van offer a highly professional service for those smaller removals. We often help local businesses out with an office move or perhaps you need a delivery to an exhibition with the peace of mind it will arrive on time and with a service that is really second to none. We have helped dozens of local companies looking for that extra special service. For smaller moves in and around Brighton then use our Brighton Man and Van Service. I hand pick my team for their passion and dedication. We are all cut from the same cloth – always putting service and the relationship with the customer above doing a quick or botched job. I believe that my team is the best so bear this in mind when selecting a Brighton Removals company. We genuinely love doing this job, and seeing our customers smile after a removal has been completed and hearing their feedback is what makes us tick! I established Tom’s Vans Removals in 2010 and have been offering Brighton & Hove customers our range of local removals services ever since! Domestic removals or office removals in Brighton & Hove or further afield. We will make things easy and straightforward for you. Before booking your Removal in Brighton with Tom’s Vans, have you thought about packing? Do you need our Brighton & Hove packing services? We have a dedicated team on hand to assist with packing your precious items away! Ask me for a quote or more information. We also provide fantastic value double walled boxes and packing equipment. Have you seen our latest reviews? No?! Click here to read them! Freeindex Reviews also our huge number of independent Google Places Reviews. Over the years at Tom’s Vans Removals, our hard work has paid off and we have a reputation that is truly second-to-none. I will always discuss your requirements in a friendly manner and offer straightforward, honest advice. We carry full insurance and our vans are brilliantly equipped with tools, blankets and straps. We provide great value sofa and mattress covers too, which are available on request. Our vans are picked for being modern, efficient and reliable removals vehicles. You are welcome to travel in the removal van whenever there is a spare seat! We love to meet new people; having company on the journey is always a fun and interesting part of the job for Tom’s Vans Removals! Tom’s Vans Removals are a fully insured Brighton Removals service. A removals company you can trust and will enjoy working with. We also offer reliable logistics solutions to local businesses requiring that little bit extra! We have goods in transit cover in the very unlikely case something goes wrong. Don’t risk using an uninsured removals or man and van company in Brighton and Hove – use Tom’s Vans Removasl! We believe strongly in prevention being better than the cure; my motto is to treat every box as fragile. Welcome to my blog, thanks so much for finding me! I established Tom’s Vans in 2010 and since then I have not changed my goal – to be professional, fun and affordable. I feel that although we are small, we offer the most friendly, reliable and unique Man and Van service in Brighton & Hove. Our reviews are often the only thing a potential customer can rely on when choosing and locating a trusted removals company. Make sure you choose a Brighton Removals and Man and Van and Packing Service you can rely on. I am often asked to assist customers who have been left in the lurch by a man with a van or removals company in Brighton & Hove. I find this frustrating enough, and I’m not even the one moving! I also passionately believe in using independent, local businesses. Every customer is so important to us, both domestic and business customers. This is why Tom’s Vans Removals has such a great reputation since setting up in Brighton & Hove in 2010. The feedback we get from businesses We help local businesses with office removals, business relocations, trade fair and event deliveries. The feedback we get and the trust gained in really encouraging. We are often told that the service we offer is far superior to bigger companies who charge a lot more, but fail to offer that personal service. We use several platforms for our trusted removals reviews. Google + is our most popular. A fantastic way to engage with my customers at Tom’s Vans – Your Local Man & Van! Offering a trusted removals and man with a van service is one thing, but how do we keep our customers up to date with the latest things we have been up to? Be sure to keep in touch about my Brighton Man and Van service by following us on Instagram, Twitter and Facebook! All our reviews are totally independent and can be seen in full by simply googling Tom’s Vans Brighton or by clicking on the review tab at the top of the page! Time to move? Toms Man and Van Brighton Company Can Help! Need a really friendly Brighton removals service? Happy New Year to all our customers past, present and future! Tom’s Vans is a Man with a Van Brighton removals service that’s a little bit different. I started helping people in Brighton with Light Removals, Furniture Deliveries, Man with a Van services 4 years ago. Since then thanks to amazing reviews and repeat customers the business continues to flourish. I now have 3 really lovely people working with me. Tom’s Vans covers Removals in the Brighton area, but also much further afield. We have been hired to move businesses and people’s precious belongings in France, Spain, Switzerland and Italy, as well as all over the UK of course. When helping people the comment we most often receive is ” the last guys we used were grumpy and unprofessional, you guys are lovely” or something along these lines! We have helped many local businesses by delivering their items to exhibitions and trade shows. We always put that little extra in the ensure everything goes smoothly. We pride ourselves on staying calm, and positive. We are small but have been contracted by companies small and large to deliver their items or products at a reasonable rate, on time and always with a smile! Give us a call or drop us an email to see if we can help! We look forward to hearing from you. – Thanks James from Burgess Hill (Sustrain UK)! My reviews can be found on Yelp and Google+! “Tom helped me with an office move last month and he is thoroughly professional in his business; proactive (he called me back!) punctual, helpful, practical, reliable . . . he gets the job done. That alone would be enough to warrant a recommendation, so it’s a bonus that Tom is very personable and good Brighton removals company to boot. Interesting line in hobbies too! Tom’s Vans – a shiny new Brighton removals van! 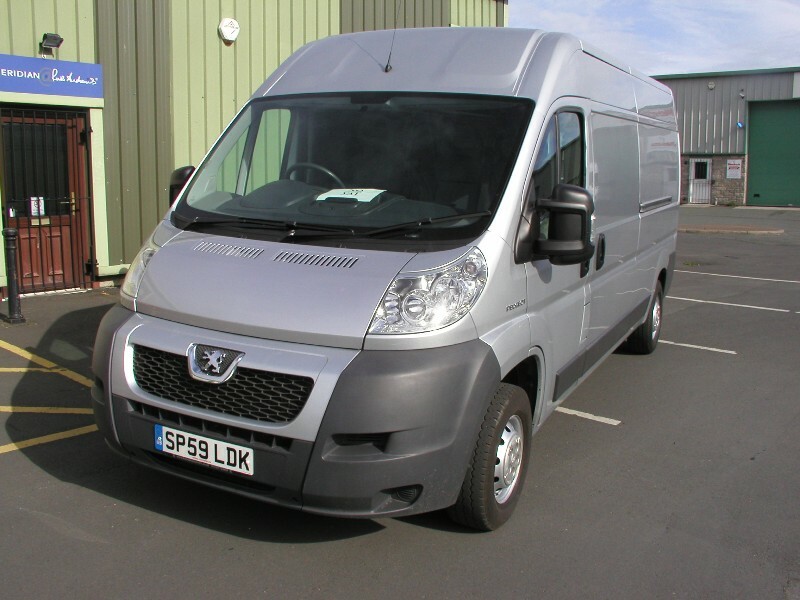 Our handsome new Peugeot Boxer Van which boasts a huge loadspace, great comfort levels, low emissions and great reliability. Also available is a lo-loader Luton van for those larger moves.